Thanks to Plein Air Curacao! Elsbeth and Marcel Kooyman were our hosts for the week. They had three cute pups (BiBi, Raisin, and Stitch) that greeted us daily and sometimes spent time in our room. While we were there, their daughter Samantha was preparing to leave for Holland and then go on to Australia for several years to launch her culinary photography career. The entire family was so very kind and offered such gracious hospitality. Monday night, we shared Marcel’s amazing cedar plank grilled salmon, and throughout the week, Elsbeth’s energy bars and smoothies topped with chocolate bits. Elsbeth and Marcel Kooyman offered many kindnesses that greatly endeared them to us. I miss you Elsbeth and Marcel…want to thank you for a lovely, memorable, so very comfortable stay…and look forward to seeing you again in 2017! 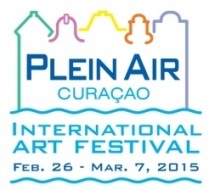 The Plein Air Curacao (PAC) International Art Festival was launched in 2011 by Hellen Chirino. My painting and traveling partner, Nancy Tankersley of Easton, MD, was integral to PAC’s establishment, and she was also the originator of Plein Air Easton. The PAC festival was run very professionally by very committed staff and many generous volunteers and host families, all under the supervision of Hellen who saw a vision for a “Plein Air Curacao” event. I found Curacao to be safe, driving to be very doable (albeit somewhat confusing to drive until I had the “lay of the land”), affordable in terms of the value of the dollar for food, restaurant, and other purchases, and the people to be extremely relaxed and welcoming.